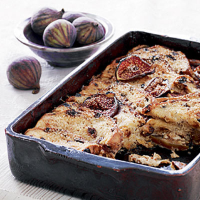 Fresh figs, caramelised with honey, add extra stickiness and texture to this classic English pudding, made with a fruited loaf and creamy custard. Preheat the grill to its highest setting. Place the figs in the base of a shallow 20 x 32cm ovenproof dish (in which you will cook the pudding later) and drizzle with the honey. Cook under the grill for 5-6 minutes until the figs start to turn golden. Preheat the oven to 180°C, gas mark 4. Leave half the figs in the base of the dish and retain the other half (reserving a couple to decorate the top of the pudding). Scatter half of the mixed peel over the figs. Butter the loaf and cut each slice in half. Place half the slices slightly overlapping each other over the figs, top with the remaining figs and mixed peel, and finish with another layer of bread. To make the custard mixture, whisk together the eggs, milk and vanilla extract and pour over the pudding. Place the reserved fig slices on the top and sprinkle the demerara sugar evenly over the pudding. Bake in the oven for 40-45 minutes until the top is crispy and golden and the custard is lightly set. Serve with single cream. When figs are out of season use dried figs, roughly chopped. Try using slices of brioche loaf or croissants instead of the fruited bread. Such a sweet and luscious dessert is crying out for an equally delicious dessert wine. This recipe was first published in Wed Oct 01 01:00:00 BST 2008.